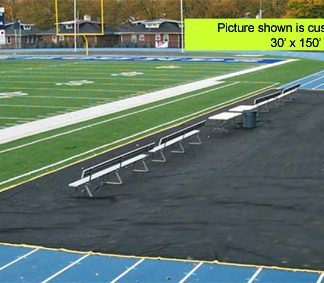 Toughest polypropylene geotextile material resists and cushions against steel tipped cleats, shoes, and even grounds equipment wheels…yet rain drains thru. 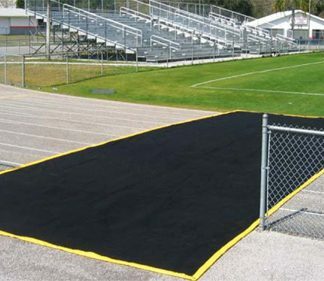 Its entire edge is wrapped in vinyl with galvanized steel chain inserted all around, keeping the protector in place and virtually wind-proof without the use of stakes or staples. 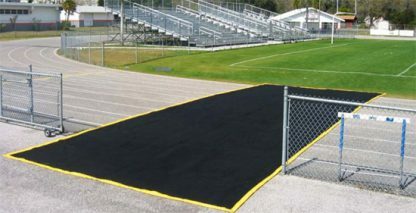 The black geotextile material comes with standard border colors of white or yellow. 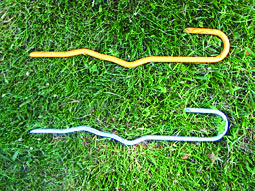 Other border colors available shown below for an additional $20. Available with Chroma-Bond® custom imprinting as a bonded overlay of VIPOL® Matrix.